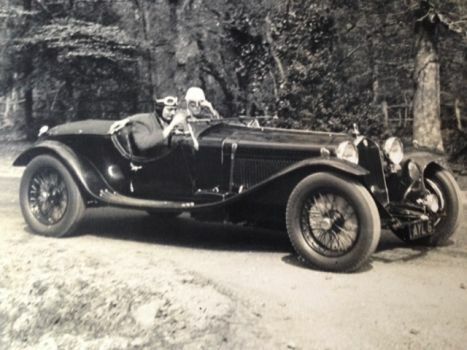 PHOTO : shows my father, pre-war, in the Ex-Works 1932 Le Mans 24-hour race, Guidotti/Cortese 1932 Alfa Romeo 8C 2300, car no 11. Finished 2nd overall, behind Sommer and Chinetti in 2111018. Registered pre-war in the UK as AYL 6, chassis 2211063 with Le Mans body, coachwork by Touring of Milan. This car was then placed 2nd after leading against Earl Howe & 5th on handicap at the 1932 Ulster TT at Ards with Tim Birkin at the wheel, car no 3. This important 8C 2300 Alfa was later owned by Mr Lauchan Rose of Rose's Lime Juice, John Willment, Bill Shortt, and Lord O'Neill.